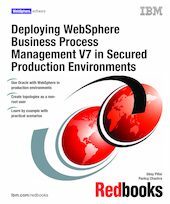 This IBM® Redbooks® publication describes how to build a production topology for business process management (BPM) solutions. The target audience is IT architects and IT specialists who want to implement a production topology in secured production environments and who have a high-level understanding of WebSphere® BPM products. This book emphasizes the steps for a successful installation without root access and without a graphic user interface (GUI).